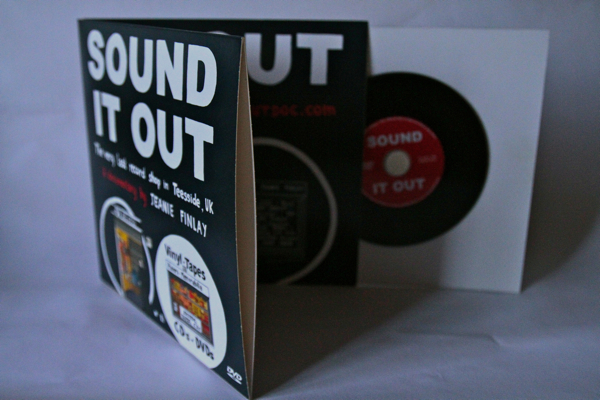 We have produced an ultra limited edition 7″ gatefold version of the DVD. 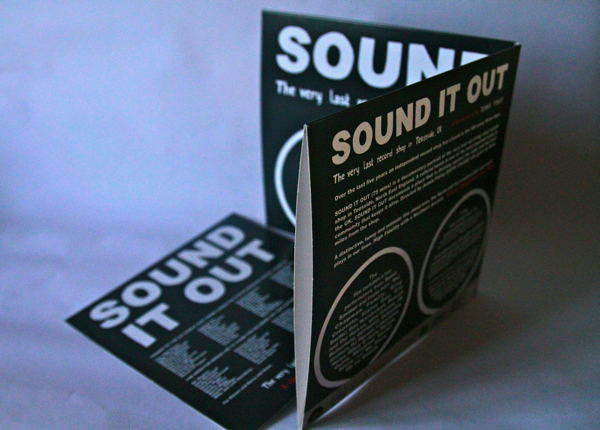 Featuring double 7″ gate-fold sleeve with artwork by Amy Blackwell, DVD mounted on sleeve notes with credits for supporters of the film on IndieGoGo and thank yous by the director. 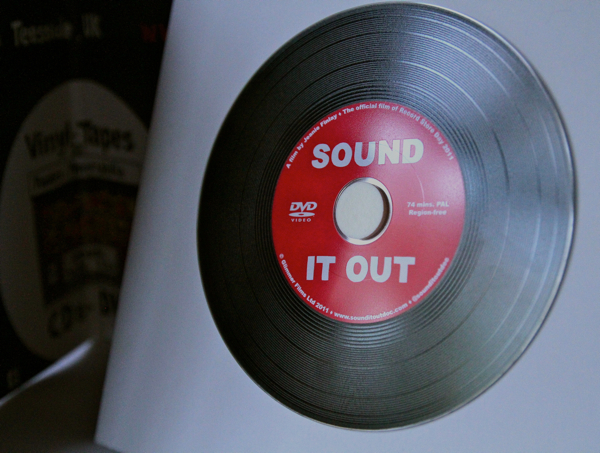 DVD is printed with grooves, just like a vinyl record. Including a 4 track baby blue vinyl soundtrack ep – featuring tracks by Saint Saviour, The Chapman Family, Detective Instinct and Das Wanderlust. 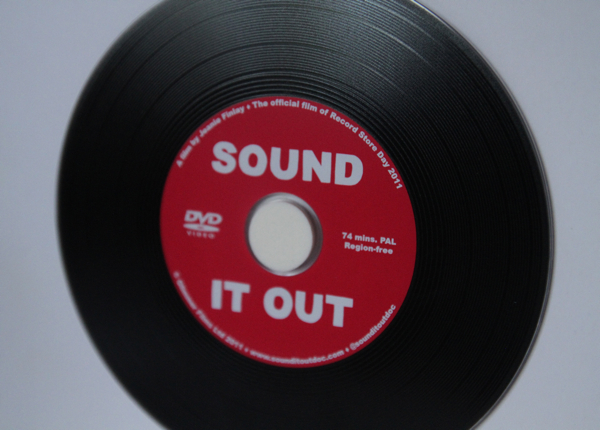 We will be releasing the film in February 2012. email hello “at” sounditoutdoc.com to be added to the mailing list – or go see the film in a cinema soon! Thanks. Hi Tony – does that mean you want to be added to the DVD waiting list? Hi Tony, mmmm the smell of vinyl! We’ll get in touch with Flavel Tat and see what they say. 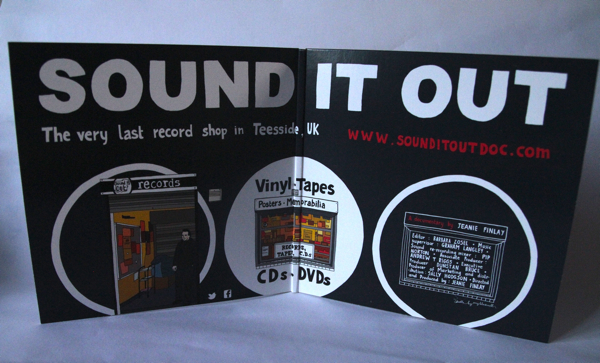 Could you add me to waiting list for the DVD/7inch single? Hi, Saw you on BBC breakfast, brings back many memories from the 70s and early 80s tralling through Mike Oldfield records. Please add me to your mailing list as and when the dvd comes available. Is the film due to be shown in the Bedford area at all? We’ve added you to the waiting list. What is your local cinema in Bedford? Hi there, any chance your film will be shown in Cork, Ireland? Otherwise please add me to the dvd waiting list. We were talking to someone about showing in Cork but it’s not been confirmed yet. What is your local cinema? Caught you on BBC Breakfast this morning. Looks like a fascinating film for a music collector and record store lover like me. Could you please add me to the list for the DVD (Don’t suppose a blu-ray is being produced?). Are you screening in Sheffield? Possibly somewhere like The Showroom? Thanks! Consider yourself added to the list. Any plans for the film to be shown in Teesside or have I missed it? Thanks for reply. Anywhere in Cork city is local really for me. However the arty places or either the Camden Palace Hotel or the Triskel Art Centre. Have you been in touch with these? I will try to get in touch with them. The film looks very good, please add me to the mailing list. If only more record shops still existed! 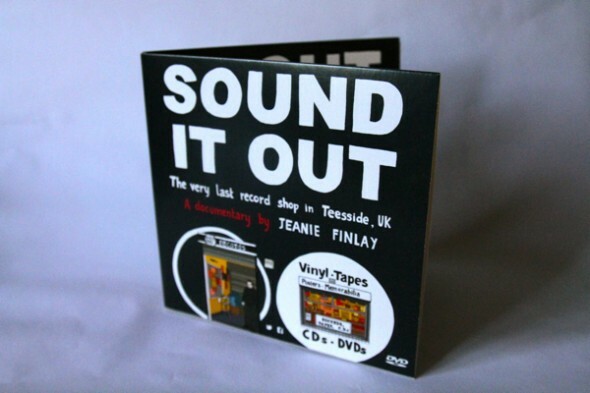 Would Love to see this – I spent many years living in Teesside obsessively visiting the independent shops in the early nineties ; any ideas of a screening anywhere near Birmingham? Hi Graham, we have already shown in Birmingham at The Mac – do contact them to request the film again and perhaps they will bring us back. I think the nearest may be Shropshire tonight and Nottingham in December 16,17 and 18th. Best wishes. Please add me to the mailing list,can’t wait to get one. Please add to this spanish fan!, Let me know the shipping costs and payment options as soon as this dvd is available in 2012. Many Thanks and congratulations!! Hi, Can you add me to the DVD list please! Hi, please add me to the mailing list. Looking forward to seeing it at The Cameo in Edinburgh this Wednesday. Alan (formerly from Darlington). Just in from the Arc – amazing film, amazing shop, amazing people – congratulations to all involved. Please add me to your mailing list and I look forward to my first visit to the shop in a long, long time. Mint! So glad you liked it Bob. Hi, Please add me to the mailing list, looking forward to seeing this. Saw the film at the Arc in Stockton, brilliant!!! Hello, just put my name forward on the mailing list, just wondered if this email will feature the cost of the release? And also could a picture of the vinyl record be posted? Cheers! Such a brilliant film! Couldnt take my eyes off it! Hello. 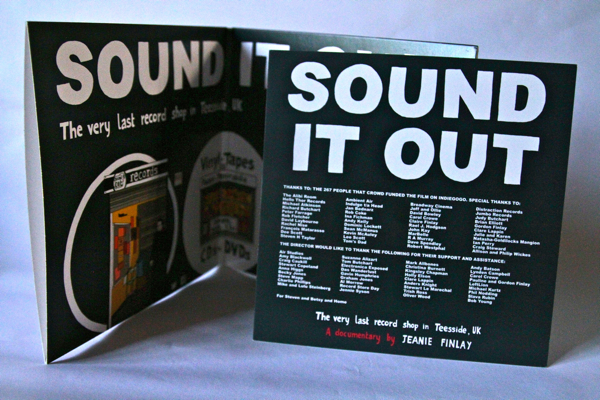 Please add me to the wating list for the DVD / 7″ soundtrack. Thanks! Hi, I saw the doc on a flight to NY and loved it. Any plans on releasing a region 1 version of the DVD? Thanks! Unfortunately, the link to join the mailing list isn’t working. Can you add me please. Saw the film in Manchester and absolutely loved it! Just fixed the link – please do complete your details and join. Thanks. hi there, i really want a copy of the dvd when it comes out, could you add me to the mailing list please, can’t wait to see it! You’ve just joined the mailing list so looks like you’re all sorted. Watched this last night. Excellent! Please could I be added to the dvd waiting list? Please add me to the mailing list. Long live vinyl and the awesome Chapman Family!!!!!!!!!!!!!!! I would love a copy of the DVD and vinyl!!!! Please add me to the mailing list, I really want a copy of the DVD when it’s released! Hi any chance this may be shown in Australia?? 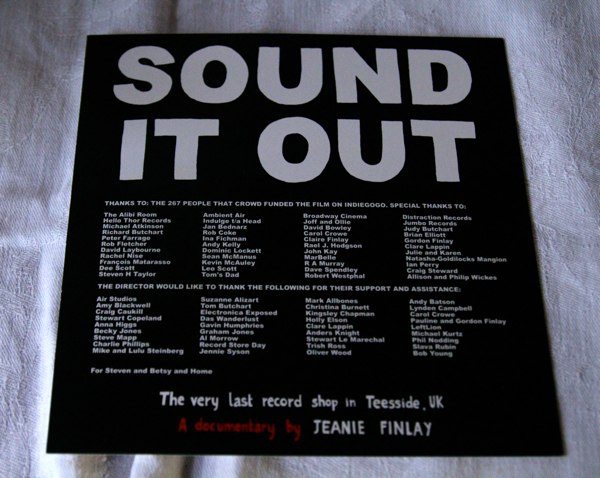 Can you please tell me the name of the wonderful piece of music used on the end credits to the documentary ‘Sound It Out’-Thanks from Andrew.